Went To The Dance Lookin’ For Romance, Saw Barbara Ann And I Thought I’d Take A Chance… | HAIL DUBYUS! Bush says he’s committed to diplomacy, but when has it been easier to believe he’s telling the truth instead of assuming right off the bat he’s lying through his tentacles? I got the idea for this last summer when the saber-rattling started, and I’d LOVE to do it as a video, but then I’d have to get permission from the Beach Boys and I don’t even know how to contact them. And yes, I do remember that there was a gung-ho rock version from the 70s, but I think it’s time for a remix, don’t you? WOW, where do other cartoonists get this kind of energy? LOL they hire inkers and colorists! OK folks, Fred’n’Bert are safe in an undisclosed location and my GOOD FRIDAY cartoon is done. I’ll be taking Monday off since Sunday will be spent with family and friends, so I won’t be publishing until Wednesday. Have a happy Easter and gorge on mucho chocolate! Let’s Bomb Iran, oh, that’s the plan. We’ll be lockin’ ‘n’ a-loadin’, things’ll be explodin’, Let’s Bomb Iran! We’ll be lockin’ ‘n’ a-loading, your kids ‘r’ all explodin’ Bomb Iran! Oh, we’ll be lockin’ ‘n’ a-loading, people all explodin’ Bomb Iran! Let’s Bomb Iran, yes, that’s the plan. there’ll be lockin’ ‘n’ a-loadin’, cities all explodin’, Bomb Iran! 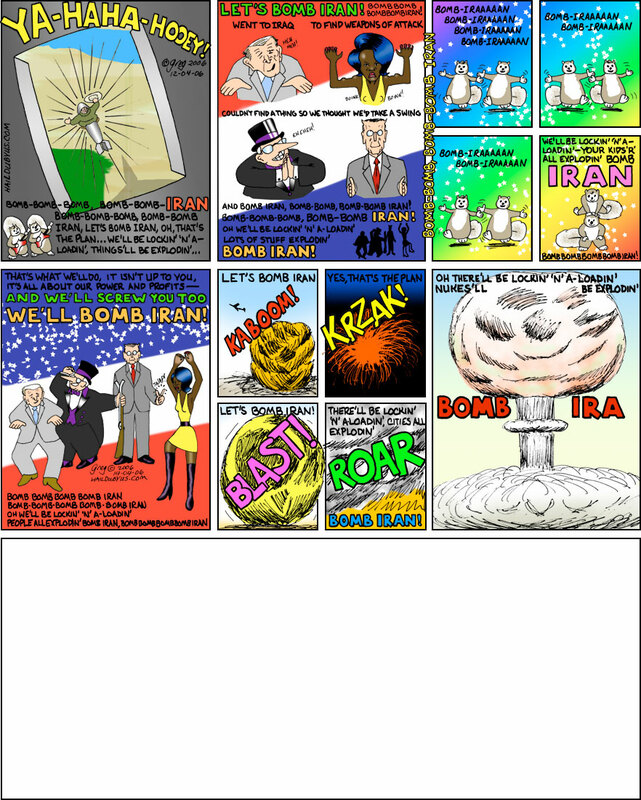 (Note: the first three panels of this cartoon were originally called “bombombomb_bombomb_iran.jpg” and appeared on April 12.